Motörhead are an iconic British rock band, originally formed in 1975 and still going strong. Their original sound, hard work and creative musical development has seen them become one of the world's most renowned rock bands, with a vast fan base across the globe. The band was originally formed by Ian Fraser Kilmister in 1975. He's more popularly known as Lemmy and is the singer, songwriter and bassist for the band. 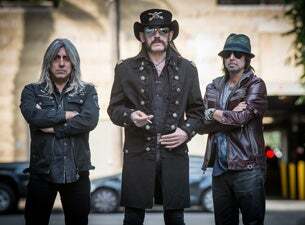 In a changing line-up, Lemmy has remained the only constant member throughout Motörhead's 35 year history. Other band members include — or have included — Brian Robertson, Larry Wallis, 'Fast' Eddie Clarke, Lucas Fox, Peter Gill, Mikkey Dee, Wurzel, Phil Campbell and Phil 'Philthy Animal' Taylor. Girlschool and the Plasmatics, amongst others. Their career has seen Motörhead release over 21 studio albums, along with 12 compilations, 10 live albums and 5 EP releases. The most successful chart success for this power trio was during the early eighties, when they had a number of singles in the Top 40 charts. One of their most successful singles – and one that crossed over into mainstream appreciation – was The Ace of Spades, released in 1980. Some of their most beloved albums include the Ace of Space, Overkill, Bomber, Aftershock, The World is Yours, Kiss of Death and No Sleep 'til Hammersmith. They have sold over 30 million albums across the world and toured extensively across the Americas, Europe, Asia and Australia – often returning to their UK roots when they can. They have also played at a variety of festivals, including Reading and Leeds and European events.